Welcome to our Early Spring Show featuring several brand new artists to the gallery. Rachel Arif is a landscape painter based in London, who spends much of her spare time along the Suffolk Coast, where she is inspired by its enchanting coastlines, picturesque rural villages and woodland areas. 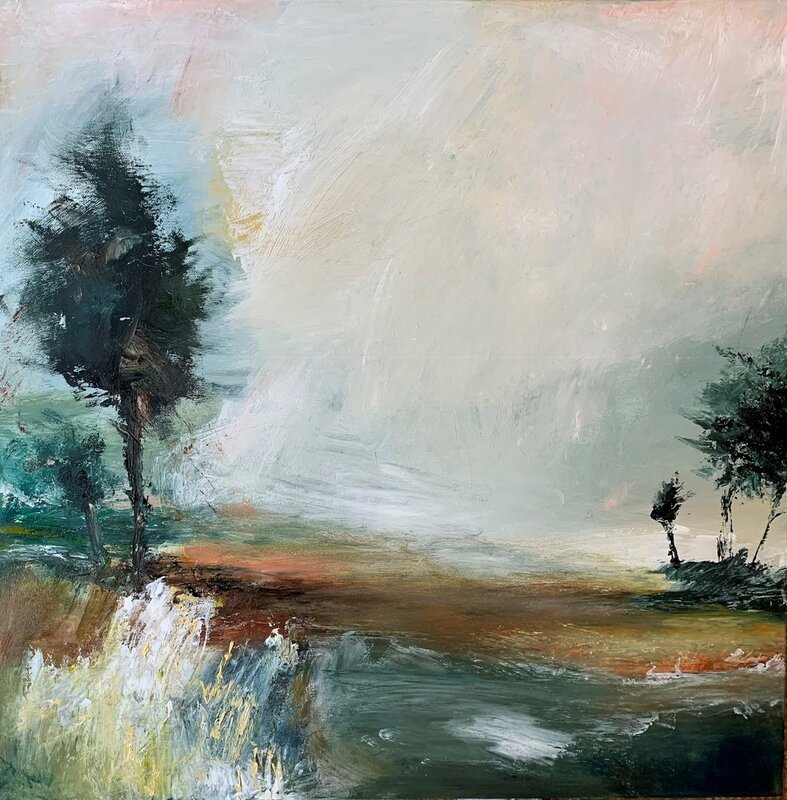 Her work is semi-abstract, capturing the intense force of the weather as it shapes our lives and natural landscape. Since graduating, Honor Surie has practised in graphics, ceramics, sculpture and painting. She moved to the Suffolk area in the late 70’s and the coastal landscape became her main inspiration. Her paintings capture the landscape’s mysterious meditative quality, the eerie pale light spilling from seas, rivers and skies. Sara Johnson trained at Winchester School of Art and Loughborough College of Art & Design where she specialised in woven textiles. Her interest in textural effects combined with atmosphere is portrayed in her watercolour and more recently, acrylic paintings. Sara's work in our show focuses on Cambridgeshire fens. Penny Frith draws inspiration from her travels to the scenic coastlines and landscapes of the UK and France. She strives to convey a sense of tranquillity along with a luminous light filled quality through use of colour and proportion. Last year cambridge contemporary art was honoured to be asked to choose the Best Print in Show at the Cambridge Original Printmakers Biennale 2018. Terry Bryan's 'Autumn Grassland' was selected and we are very happy to be showing the winning print and a selection of other works by the artist during our Early Spring show. 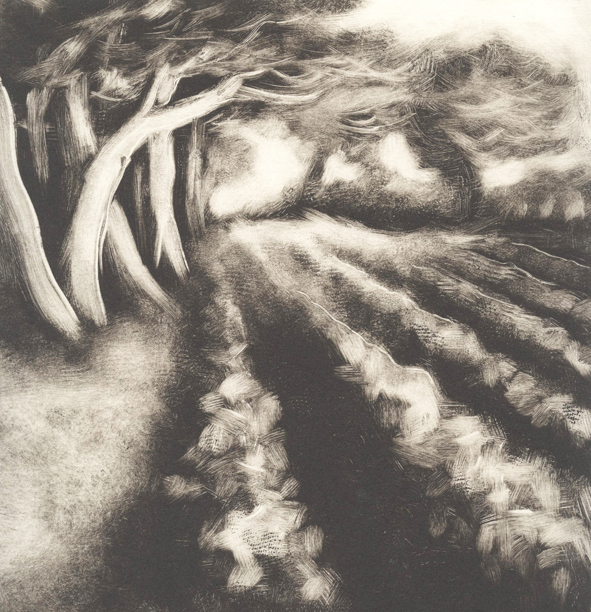 Terry Bryan, a printmaker and graphic artist, works from his print workshop in rural Essex. For over four decades he worked in the world of graphic design, achieving success both nationally and internationally for himself and his clients alike. Chrissy Norman works in a traditional way using soft or hard ground on copper or zinc with aquatint, etched in acid. Much of her work is printed using coloured inks blended on one etching plate, carefully wiped and then passed through an etching press. Chrissy is inspired by the East Anglian coastline and the effect of light and season on the landscape. Local ceramicist Amanda Banham is our featured artist at the crafts gallery this month. If you haven't yet seen how she has transformed our window display with retro toys - don't wait, her work has been flying off the shelves! If you're not local to Cambridge, we have added all of Amanda's pieces to our online shop. You can be a proud owner of one of her ceramic houses or a rainbows in just a couple of clicks! Click here, to shop online with us. The craft gallery is open 10am to 5.30pm Monday to Saturday.